"I am Australian" - The Victorian Bushfire Memorial Service for the 'Black Saturday' bushfires on the 7th February 2009. (Includes two new verses penned by Bruce Woodley for the Memorial). Performed by Bruce Woodley & Claire Woodley joined by Merelyn and David Carter survivors from the Kinglake fires. Kevin Rudd's speech today was awesome... what a great Prime Minister!! "Fellow members of the great Australian family. When the histories of nations are written, there are times which sorely test each nation's soul. Whether through the carnage of human conflict or through the terrifying forces of nature unleashed. This nation Australia has just been put to such a test. And you the people of Australia, you the people of Victoria, and most especially you the people of these fire-ravaged communities – you have faced the test – and you have not been found wanting. As a people, we weep for the lost. And yet our work has barely begun. In meeting this great test, as a people, and as a nation, we have drawn deep on our ancient values and given them fresh voice in our modern age. These are Australian values. Values also of our deepest common humanity. For on Black Saturday, what we saw at work was the worst of nature yet the best of humanity. We know it by instinct. We see it. We feel it. Courage is a fire fighter standing before the gates of hell – unflinching, and unyielding and with eyes of steel saying this: "Here I stand, I can do no other". Courage is neighbour saving neighbour. Courage is stranger saving stranger. Courage is all these things as brave women and men in their lives and in their deeds these last weeks have written a new chapter in our nation's story. A new army of heroes where the yellow helmet evokes the same reverence as the slouch hat of old. In recent days, we have witnessed unspeakable suffering. We have lost mothers and fathers, grandmothers and grandfathers, brothers, sisters, sons and daughters, the tiniest of children, family and friends and neighbours. All these are precious lives. No words can provide solace for grief so personal. But simply know this: you who suffer are not alone. This great Australian family, here assembled and across the nation today, is with you. And led by an almighty army of Australian volunteers stretched across this vast continent. And beyond our shores, know too that you are also surrounded by an ocean of compassion from every country on God's earth. In some countries, tragedy exposes the fault lines in a nation. The strong abandoning the weak; one region indifferent to the sufferings of another, one culture uncaring as to the needs of another. But ours is a different nation. Our nation has been as one. Australia – a nation of compassion. Courage and compassion. And the third of these great values: resilience. What we have seen in each of these communities is resilience writ large. Resilience reflected in the absolute and resolute determination to rebuild. And this is where the nation comes in. A solemn contract with each of these communities to rebuild: brick by brick, home by home, school by school, church by church, street by street, community by community. Governments of all persuasions and at all levels have failed communities in the past. Let us resolve not to fail these communities in the future. To say this is easy. To do this will be hard and the path will be uneven. But let us resolve, learning from the mistakes of the past, to rebuild together. To rebuild Marysville, Narbethong and Toolangi. To rebuild Kinglake, Kinglake West and Flowerdale. Strathewen, St Andrews and Humevale. Wandong, Heathcote Junction and Upper Plenty. Steels Creek and Yarra Glen. These names and others that are now etched deep in the nation's memory. For the truth is this: each of these communities is Australia – and we would be a lesser Australia without any of them. So let us to the task. Last Sunday as I travelled on the road to Kinglake, it was as if I was walking through the valley of the shadow of death. Last night I spoke with a young woman from a community nearby who had lost everything but survived. She told me she had spent yesterday with her Dad, starting to clean up the wreckage. She told me the first thing they did was to plant a charred sapling in the burnt ground as their flag pole – and put up our nation's flag. She told me she and her Dad then sat quietly together just looking at the flag – and then to work. Our nation's flag now flies across the charred remains of these precious communities – flags by the hundred. Great Australian values that will see Australia through this great testing of our nation's soul. 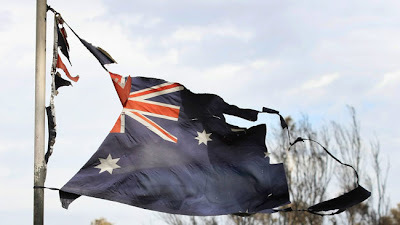 So let us resolve today that from this time forth, on every 7th of February, this nation’s flag will fly at half mast, this nation will pause for a moment’s silence, to honour those lost and to reaffirm afresh, this great rebuilding for the future. As we rise together in hope, from the ashes of despair." Cheers & many many thanks for posting the videos & speeches from Australia's National Day Of Mourning ceremony. The spirit of this great land...we are Australian!! !